The field proven Rugged Systems™ UPS line is ideally suited for military,industrial, computer and telecommunications applications requiring high reliability, rugged construction, compact size and light weight design.These units are equally suited for use in shipboard, airborne, vehicular, fielddeployed or fixed locations with controlled or uncontrolled environments. The"
ETI0001-1451" was specifically designed for US Navy rack systemsrequiring higher power requirements. In typical installations, the 3Uelectronics module is mounted in the upper section of the rack near eye level.The "
ETI0001-1451" does not require a separate PDU since the PDUfunctions are already integrated into the UPS module. This saves rack space,cabling and expense while improving overall reliability. The heavier 3U battery module is then mounted in the bottom of the rack for lowering the center ofgravity of the rack. A 12 foot heavy duty shielded cable is provided to connectthe two modules. Both chassis have roundedmetal corners and rugged handles, both front and rear, aiding in safe handling. Internally, all major components are well secured and electrically insulated to preventdamage due to shock and vibration in any axis. These units can be mountedhorizontally or vertically. The internal shieldedinput transformer provides galvanic isolation with provisions for domestic (115 VAC, CONUS) and optional autoranging international input voltages (85-270 VAC,OCONUS). Theunit also operates as a frequency converter, taking 46-70 hertz input and converting it to 60 hertz power. Special EMI/RFI filters and input power factor correction minimize both input current and harmonics. The inputcircuit breaker and the galvanic isolation transformerall provide a double pole isolated source for all installations including shipboard systems oroverseas locations where phase references and grounding are not consistent. The LED arrays keep the operator informed as to the unit's status including load and battery levels. The high intensity audible alarm canbe heard in high noise environments.All controls and protective devices are brought to front and rear panels with critical switches having finger guards. Further, all front panel devices are recessed to preventdamage or accidental operation. The internal intelligent PDU allows control ofthe individual output circuits incorporating thermal and interlock interfacesfor additional control and safety, plus Battleshort override. The display andcontrol panel can be mounted remotely in the rack at eye level, or on the keyboard console,or on the unit front panel with only a logic level cable connection. The rear panel provides locking connectors for the input and output power with various optional configurations available. The output connectors are standardNEMA 5-15R with unique cable restraints. This reverse air flow version draws air through the front and exhausts out the rearvents into the rack. A removable and washable intake air filter and high capacity stainless steel ballbearing fans provide added protection in both controlled and hostile environments. The external battery connector allows the safe and easy addition ofthe standard or extra battery modules without having to shut the unit down.The batteries are maintenance free with immobilized electrolyte and are constructed of flame retardant materials. For more information, see the Battery Technology section. Afrequency selection switch is available for those sites requiring 50 hertz output insteadof the standard 60 hertz. The Status connector provides aninterface with optional computer software providing loss of AC and low battery status as well asremote shut down capability. The PDU Remote Control connector provides aninterface to optional remote display/control panels. 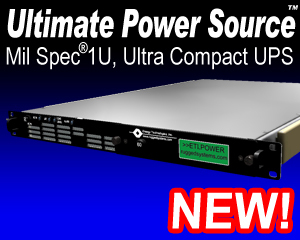 See the Power Distribution Units section for a listing of stand alone PDUs. See the N3 Series UPS section for UPS withoutthe integrated PDU and remote control.